I always love the thought of a rich hearty stew in the middle of winter, but I hate the actual outcome of my typical beef stew. Vegetables that are mushy and falling apart, meat that is tough and chewy, and a sauce that never seems to thicken correctly. 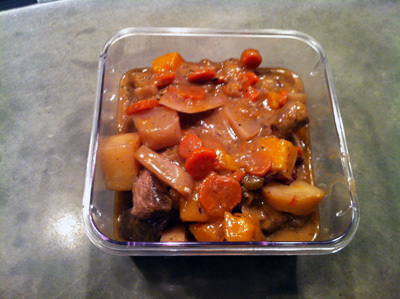 A recent Fine Cooking issue did an excellent how-to guide for stews and as I was discussing trying one, a good friend of mine (Andy Wong from The Agility Project) suggested I try modernizing it a bit by cooking everything sous vide. It sounded like a good idea, so I decided to attempt my own version of stew with a few modern techniques. Season the meat generously with salt and pepper. 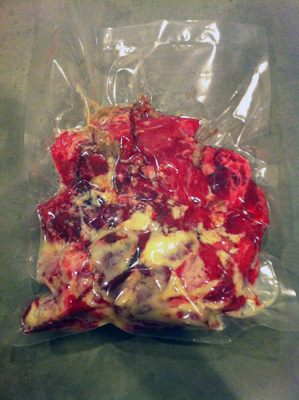 Vacuum seal in a bag with the beef fat and cook sous vide at 140°F for 48 hours. Remove the meat from the bag and allow to dry on paper towels. Reserve the cooking juices in a separate bowl. In a high sided saute pan, fry the bacon on medium high heat until most of the fat is rendered and it’s just beginning to crisp. With a slotted spoon, remove it and place on a paper towel lined plate to dry. In the same pan, sear the meat on medium high heat in batches, ensuring a nice brown crust on all sides (about 30 seconds per side). Do not overcook or you’ll ruin the perfect temperature from the sous vide cooking. Place the meat in a container and refrigerate until needed. 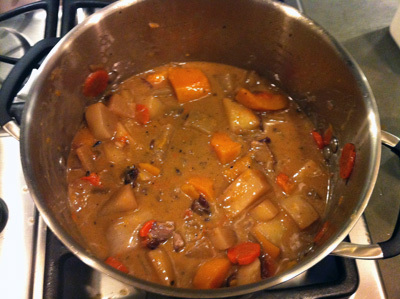 In the same pan, add the celery, onions, and carrots and cook on medium high heat until softened (about 5 minutes). Add the tomato paste, garlic, and bay leaf and cook for 2 more minutes. Add the bacon back to the pan. Add the red wine, turn the heat to high, and boil until reduced by half. Scrape up all the brown bits on the bottom of the pan. Add the beef stock and stir to combine, bring up to a boil and then turn off the heat. 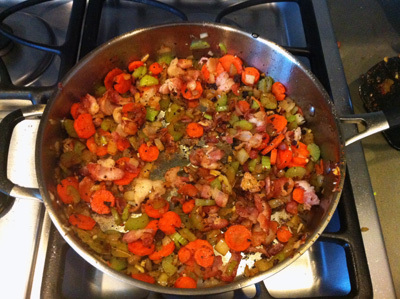 Measure out the liquid, mirepoix, and bacon mixture into three equal amounts. 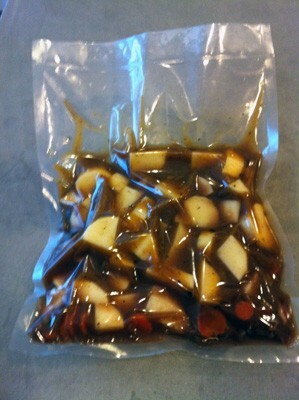 Place these into three sous vide bags and place the turnips, butternut squash and potatoes one type in each bag. Using a chamber vacuum sealer makes this much easier, but you can also use a regular ziploc and try to remove as much air as possible. Cook the vegetables in a water bath at 185°F for 45 minutes. Once finished, strain the vegetables reserving the liquid separately. Weigh out the amount of liquid you have (around 850g is normal) and multiply this amount by 0.0035 (0.35%) to determine the amount of xanthan gum needed. For 850g of liquid this amounts to 3g. Measure out the amount of xanthan gum needed and add it to the liquid; allow to hydrate for one minute. 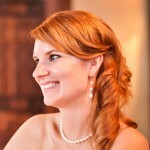 Using a hand blender, mix in the xanthan gum until thoroughly incorporated (about 30 – 45 seconds). The sauce should be thick enough to coat the back of a spoon. Season with salt and pepper to taste. Add the lemon juice and stir to incorporate. Place the sauce into a deep sided pot, add in the vegetables and the reserved meat. Warm on low until the meat is just warmed through and the entire mixture is well combined. In Thomas Keller’s (non-modernist) beef stew recipe, he wraps all his mirepoix in cheesecloth while they stew and give up their flavors into the broth. He then considers the veg to be “spent”, having given all their flavors up to the liquid, and so discards them and replaces with fresh new vibrant veggies to be served with the final product. Perhaps a modernist adaptation of Keller’s approach would be to stew the broth and mirepoix wrapped in cheesecloth in a pressure cooker, prepare substitute veggies either sous vide (as here), or pan sauteed (as in Keller), but just with butter and herbs, and assemble the final pieces at the end. One minor comment: unless I missed it, you don’t say what to do with the reserved cooking juices — I assume that after fat is removed the remainder gets added to the cooking liquid. Love this posting! Im attempting a version myself 🙂 http://burningkitchen.co.uk/48-hour-sous-vide-stew/ I love that whilst the meat is doing it’s 48 hour thing, if we aren’t in the mood for the recipe in 2 days we could chuck it in a curry or any glorious sauce and I expect it would be wonderful. 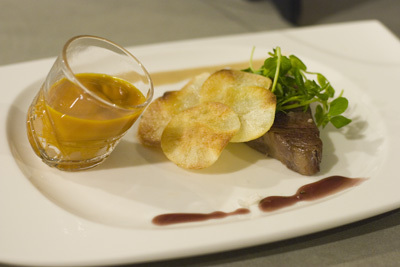 Actually may be a nice idea to always have some stewing meat always in the sous vide! A good way to do it without the chamber vac would be to prepare the broth and separate the liquid from the solids. 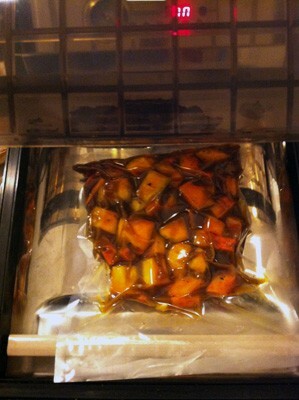 Then freeze the liquid into cubes and seal it with the veggies while frozen.